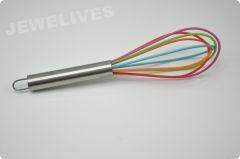 Jewelives Silicone Egg Whisk & Blander in Wide Selection.Brand new and high quality. Made of durable, flexible silicone. Soft, flexible, stretchable and washable. 4.Good for health and durable. 2. 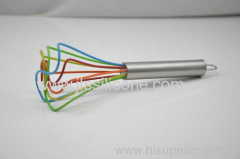 5 colors of silicone whisk. 2. 2 colors of silicone whisk. 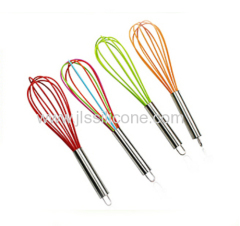 1. silicone covered whisk in candy color. Mini silicone egg whisk for Baking DIY tools. 10inch Egg whisk for Baking DIY tools. 10.5inch silicone egg whisk for kitchen DIY tools. 11.5inch Egg whisk for baking DIY tools. Group of Silicone Egg Whisk has been presented above, want more	Silicone Egg Whisk and Jewelives Rabbling Blander, Please Contact Us.